On view in the Thinkspace offices is new work by N.S David: The Big-Banged Meaning of it All. A Los Angeles based painter, David’s combination of surreal imagery and realistic figuration is unmistakably her own. With powerful paintings wrought from a personal synthesis of mythology, fairytale, and fantasy, the work is contemporary and simultaneously personal. David artfully combines the suggestion of narrative with tangential symbolism, and summons a mysterious, revelatory, power that borders on that of mysticism. The fascination and draw of her paintings is rooted in this encounter of the “known” of this world with the endless possibilities of those borne of unadulterated fantasy. With a self-proclaimed love and belief in the transformative beauty of delusion, David’s work is motivated by an inspired creativity, and by a mastery of story and imagination. Her work reads like narrative vignettes; like partial insights into a complex cosmology sustained by its own fabric of symbols and iconographies. 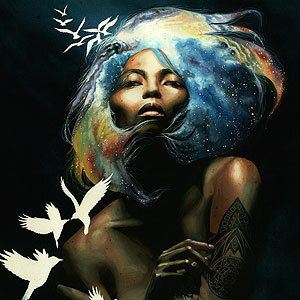 Beautifully executed with the raw power of emotive and expressive freedom, the work is sensual, mystical, and transporting. With the belief of the mystic, and the spontaneity of the visionary, David’s work is truly an encounter with another world.